How about this classic Nova? RamblinAroundTV shows off the sweet sounds of a classic old school 1968 Chevrolet Nova in this awesome video. Take a look under the hood at the 5:14 mark to see the 454 Big Block V8 engine with a manual four-speed transmission. This car has been restored with the correct white exterior color and gold interior, an SS front grille, wooden steering wheel, steel body colored rally wheels with center caps, 12 bolt rear with 3.73:1 ratio, dual exhaust with Flowmaster mufflers, lower chin spoiler and steel cowl hood. Added to the mix are under dash gauges, and power disc brakes. 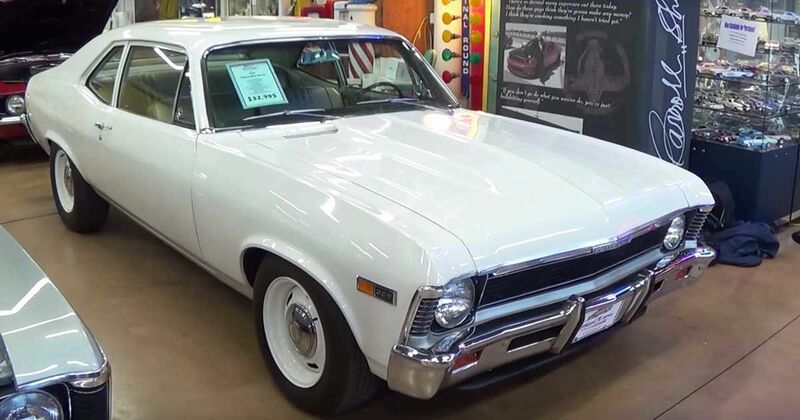 The Chevrolet Nova had a long run, in production for five generations, 1962-1979, and 1985 through 1988. According to Old Ride, the 1968 model, featured in the video, received a full redesign that included an 111-inch wheelbase and a separate sub-frame housing the powertrain and front suspension that had been introduced a year prior on the Camaro. Buyers could choose from 15 powertrain setups for the coupes, and twelve for the sedans. A number of options were available, including power brakes and steering, air conditioning, rear shoulder belts, and head restraints. A 2.51L four-cylinder engine was available between 1968 and 1970, but was eventually dropped due to low demand. The more popular option was the 4.64L V8, but you could also choose a 5.36L with four-barrel quadrajet carb and four-speed Saginaw transmission. A semi-auto transmission was offered mid-year for those who preferred clutchless driving, but was only available on the four and six cylinder models. Check out this excellent specimen of the Chevrolet Nova in the video below, and SHARE if you like it!